There really were no other theme contenders for my son's birthday this year. Diggers are on that boy’s mind all day, every day. Not sure if it’s the big tires, the dirt, the loud engines or just the manliness of it all, but he’s hooked. We had ten kids attending the party, ranging in age from 15 months to 12 years. So my biggest challenge was to have indoor activities to suit them all. ~ The cardboard construction zone was a huge hit with all ages. I constructed a bulldozer and dump truck out of moving boxes for the toddlers to crawl in. The older kids had a blast stacking the skyscraper boxes and letting the small ones knock them down. 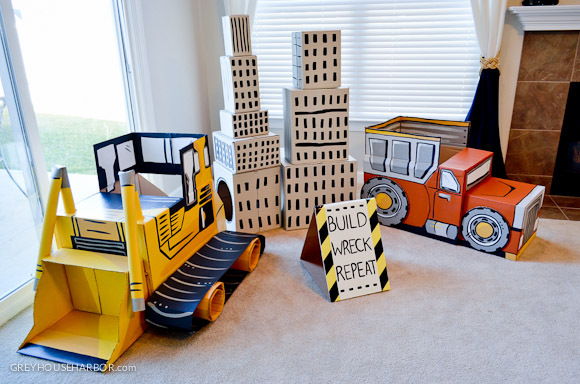 Here is a photo tutorial on how to build your own cardboard bulldozer. ~ The "Dig Pit" consisted of 20lbs of rice I dyed various shades of blue and put into a long shallow storage box. It did get everywhere, but the color does not come off on hands or carpeting and it's easy enough to vacuum up. Very popular with the 5 & under crowd. ~ The ring toss was simple stripes painted onto play cones. A cut extension cord secured with orange duck tape made the rings. ~ I designed the "Happy Birthday" banner and had it printed as an engineers print at Office Max. Cost me $1.30 for a 36x48 print! I used spray adhesive to then mount it to 2 pieces of foam core I bought at Dollar Tree. ~ My son's "2" shirt I handmade using a freezer paper stencil. ~ All kids in attendance received a "hard hat" and safety vest as party favors. Food : Brownies-on-a-stick dipped in white chocolate, crockpot spinach artichoke dip w/ pita chips, carrot sticks & ranch served in individual cups, sparkling lemonade, tortilla chips and salsa. The cake was store bought, but we embellished it with an excavator "digging" out a section. The cardboard construction site is still in my living room a week later... kids can't get enough of it. Score free moving boxes from neighbors or Craigslist! Having the party from 3-5p allowed for the food to be light snack fare, without a providing a big meal. Oh my goodness! The perfect BOY party!!! We had a construction themed party for my son last year (he was also turning two!) and it was so much fun to plan and put together. Looks like you guys had a blast! Do you still have the file for the banner that you had printed? I love this! I want to have one made for my son for his 2nd birthday unless you would be interested in selling yours?